So you have an old house and you want the kitchen to look more period appropriate. All you see in your neighbors’ houses, the advertisements, and the builders’ supply places are stone, stone, and stone. And yes, stone can be beautiful! But is it appropriate for an old house? Historically, stone was rarely used as countertop material. The method for economically processing large slabs of stone is a relatively new development. Thus, continuous stone countertops are more of a modern countertop treatment. Formica countertops from Frank Lloyd Wright’s Gordon House Silverton, OR. Wood countertop from the kitchen of the Pittock Mansion Portland, OR. Late Victorian Era (roughly 1880s through early 1900s): Most kitchens of this time period were what we refer to as “unfitted” kitchens. They did not have continuous built-in cabinetry, but instead used freestanding kitchen furniture. There was often a worktable in the kitchen, along with perhaps a dough table, and a Hoosier (a stand alone piece of furniture) in the kitchen. These freestanding pieces generally had wooden tops. Houses with butlers’ pantries had built in dressers to hold the serving dishes, but again the counters were most often wood. The Teens: During the early period of the 20th Century, the recognition of germs and their connection to disease became a societal focus. What is often referred to as the “Sanitary Movement” began to influence how kitchens were approached. Concern about easily cleanable surfaces and the ability to see where the dirt was lurking was reflected in the use of white subway tile on walls. Wood was still very common on built in dressers, but the use of tile began to emerge on the counters of dressers. The tile of the period was very sharp edged, and grout lines were extremely tight so as not to hide dirt or germs. The1920s: There was a shift in kitchen design during the 1920s, with the transition away from servants and toward the woman of the home primarily preparing the family meals. 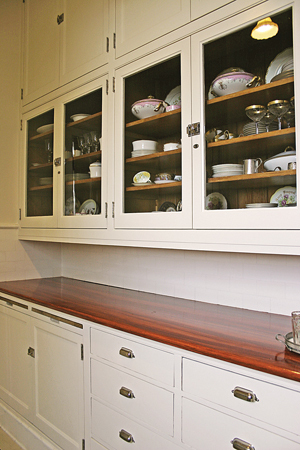 With more prepared foods coming to market, there was the need for increased cabinetry and kitchen storage. Although there were still plenty of kitchens with freestanding furniture, pre-made modular cabinetry could be ordered. Also, site built cabinetry began to become more common. With regard to countertops, once again, tile with very tight grout lines was very common. However, the 1920s ushered an era of bright and beautiful colors into the kitchen. Tile came in lovely color combinations, such as green and yellow, green and orange, yellow and blue, or white and blue. The tile was often hex tile, or sometimes-small square tile, but the grout lines were always very tight, unlike what we generally see with tile today that sports eased edges and wide grout lines. 1920s tile countertops sometimes had a marble drop-in for working pastries or making candy, but the counters were predominantly done in tile. Zinc was sometimes used to cover wooden surfaces on pullouts on Hoosiers, and institutional kitchens might have had wood counters covered with a metal called Monel (an alloy of nickel, copper, and iron). But, this treatment was very rare in home kitchens. Those on a tight budget sometimes used a scrap of Linoleum as countertop material. 1930s: During the 1930s, tile continued to be the most common home countertop material. However, there were developments with a resin called Melamine and plastic laminates, which we now is known as Formica. High-end kitchens would sometimes employ Monel on their counters, but Monel was expensive and generally seen only in commercial applications. 1940s: Yep, tile continued to be big for home countertops. However, there were changes in colors, V-Cap profiles, and pattern design that were reflective of the 40s. Hex tiles or squares were again the most commonly chosen during this period. The square tile was sometimes laid at a diagonal to create a diamond pattern for interest. Linoleum, and sometimes Formica, with a plain metal edging were commonly used, as well. 1950s: While tile was still king of the kitchen countertop, Formica began to really make headway. Formica brought with it all sorts of interesting colors in fun designs, such as boomerangs, cracked ice, starbursts, burlap, or amoebas. The metal edging on these Formica counters became ridged, which also brought a sense of design interest. One could still find Linoleum on countertops, but again it was frequently a decision driven by budgets. OK, let’s go back to the stone question. Soapstone was sometimes used on the East Coast, as that material is indigenous to that region of the country. Soapstone was used for kitchen and utility sinks, and sometimes to top work tables. However, soapstone is hard; thus, butlers’ pantries generally had wooden counters with copper sinks to prevent damage to the dishware. The kitchen sink was not where the fine china would have been washed. While stone countertops are beautiful, in the history of kitchens, this countertop material is relatively new on the scene. To really capture the essence of the period, consider reaching back in time and using a historically appropriate material on your kitchen countertop. 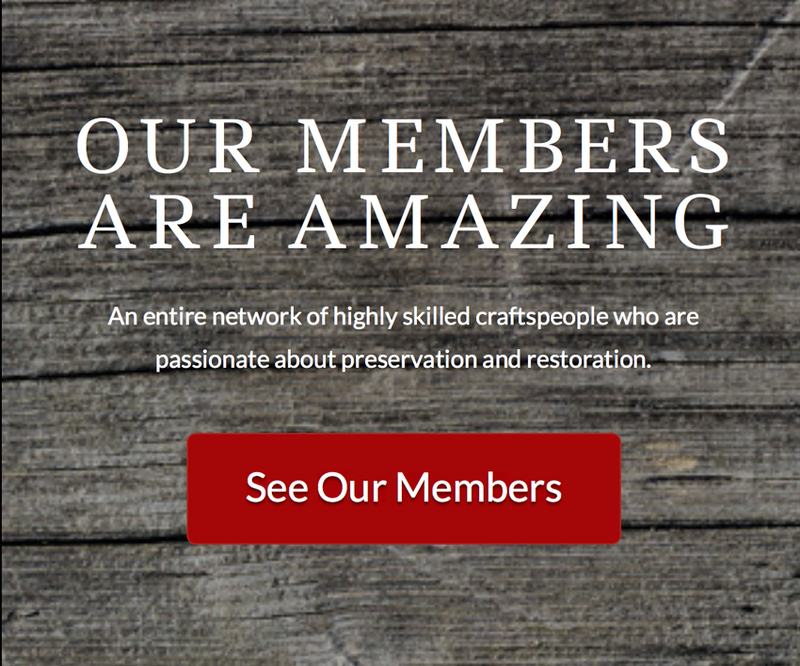 Karla Pearlstein is a preservation consultant and provides educational resources and consulting services on the preservation and restoration of historic buildings. Contact Pearlstein at 503-452-7772. For more information, visit wwwrestoringhistory.com.